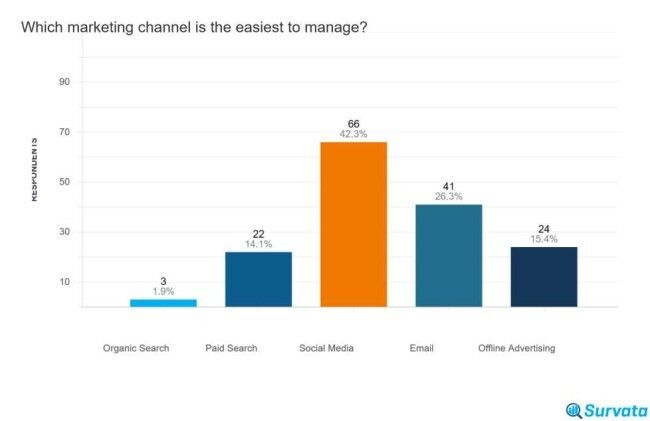 What’s the Most Difficult Marketing Channel for eCommerce Companies to Manage? Nearly a third of eCommerce businesses claimed that social media is the most difficult marketing channel to manage, beating out SEO, paid search ads, and offline advertising alike. It appears that these businesses are having a hard time with social media management. DesignRush interviewed over 150 eCommerce companies to find out about their utilization of SEO, paid search ads, social media marketing, and offline advertising. eCommerce companies who were surveyed utilized a variety of platforms, primarily their own websites, Amazon, and mobile apps. Questions touched upon topics such as marketing investments, the use of agencies, and the ROI of certain marketing channels, with responses relating to results seen in 2018 and projections for 2019. To 42% of respondents, social media was the easiest marketing channel to manage. To a comparable amount, however (33%), it was the hardest. This means that 75% of all eCommerce businesses either think that social media is the most difficult or the easiest channel to deal with, highlighting a strong polarization within social media management. Email marketing was seen as the next easiest channel to manage at 26%, while offline advertising was the next difficult at 21%. Social media may be even more difficult to manage for larger eCommerce companies. 60% of companies with annual sales between $10,000,001 - $20,000,000 said that social media was the most difficult channel to manage. Social media marketing was the primary marketing investment for half of all companies surveyed. Offline advertising and email blasts were tied for second, with around 19%. 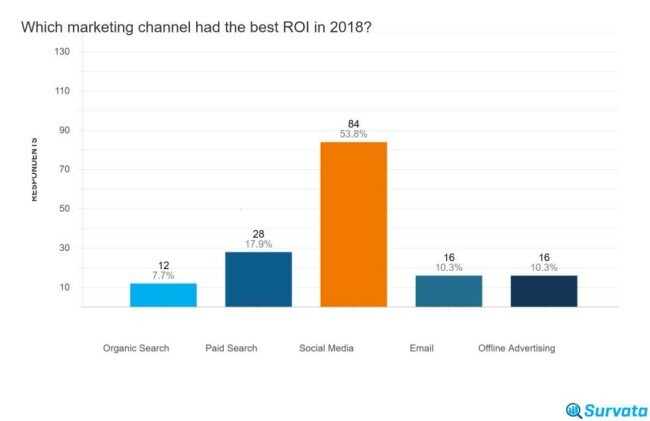 54% of respondents said social media marketing provided the highest ROI versus any other marketing channel in 2018. 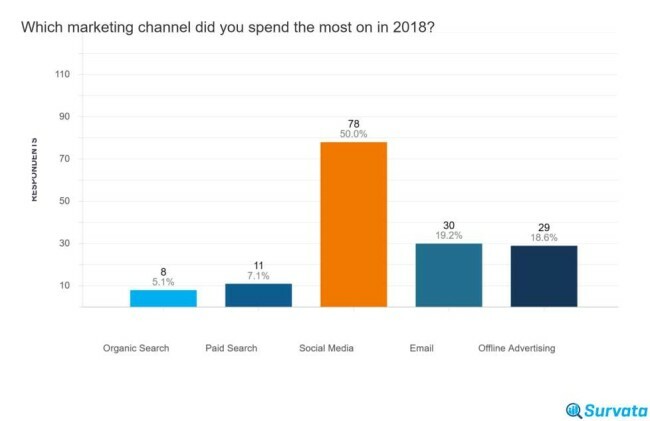 A majority of businesses plan on increasing their marketing spending in 2019. 48% of respondents say social media will continue to be their top marketing investment. Two-thirds of companies surveyed worked with a marketing agency in 2018. An increased amount plan on working with one in 2019. Social media marketing agencies were the main type of agency utilized in 2018, and this trend is expected to continue into 2019. 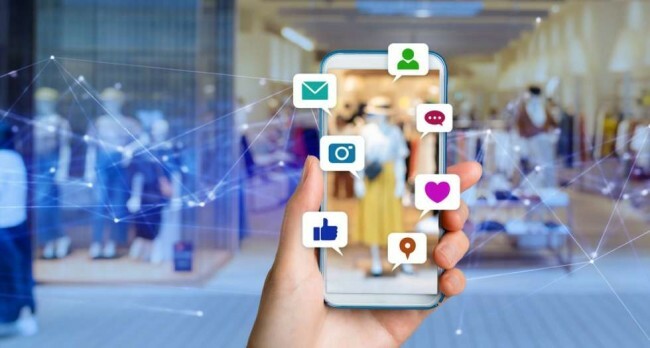 Social media marketing serves as the preferred advertising investment for most eCommerce businesses, but to many, it also presents significant management challenges. The use of social media marketing agencies can benefit all eCommerce businesses, whether or not managing social media is a challenge for them. 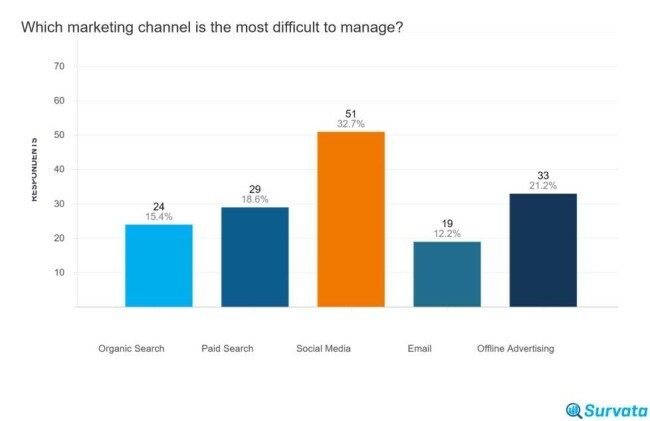 According to a 2019 Digital Marketing Industry Study from Ignite Visibility, a top SEO and digital marketing firm, a majority of businesses find social media the most difficult channel to manage, regardless of size. Although social media marketing has a very low-cost barrier for entry, it requires regular upkeep and interaction in order to be effective. While channels like offline advertising can be managed from a distance at irregular intervals, sites like Facebook, Instagram, and Twitter all require consistent engagement. One-third of eCommerce businesses surveyed said that social media is more difficult to manage than any other marketing channel. 38% of companies that earned between $5,000,001 - $10,000,000 said that social media gave them the most trouble in 2018. This number shot up for businesses making between $10,000,001 - $20,000,000: 60% gave similar reports. More than a quarter of small businesses with sales of less than $500,000 said that offline advertising was the hardest channel to manage. According to Sage Advice, the main challenges that businesses face when it comes to managing social media are consistency, content creation, and time management. 42% of eCommerce businesses reported that social media is the easiest marketing channel for them to manage. That’s nearly 10% more than those who said it’s the hardest. Three-quarters of all respondents said that social media is either the easiest or the most difficult channel to manage. Whether positive or negative, businesses reported strong experiences when it comes to managing social media. There was very little middle ground left for those that didn’t fall into this social media management polarity. 26% of companies said that email marketing was the next easiest channel to report. Managing social media can be made easier for some companies by utilizing social media management tools. Which Social Media Channels Have the Best ROI? The willingness for businesses to get engaged in social media, whether it comes naturally to them or whether it’s a serious challenge, is driven by the high ROI it provides. Over half of all eCommerce businesses surveyed said social media marketing provided their highest ROI. This number shot up for companies that made between $1,000,001 - $5,000,000, with 64% giving social media the top spot in 2018. A 2018 study by DesignRush found that Facebook is the driving force behind eCommerce conversions, especially with millennials. 50% of businesses surveyed said that they spent more on social media than any other marketing channel in 2018. The smaller the company, the higher the chance social media is their main marketing expense. 61% of companies that make less than $500,000 per year spend the most on social media, while only 44% of those making $5,000,001 - $10,000,000 do the same. While a slight shift can be noted toward paid search and SEO, social media marketing remains the primary projected investment for 2019 (48%). This number jumps to 57% for companies making between $1,000,001 and $5,000,000. For companies making between $10,000,001 and $20,000,000, social media and email investments were equally distributed, with 40% each. This may relate to the increased expenses involved with managing large email databases compared to the affordability of scaling up social media campaigns. More than 50% of eCommerce businesses plan on increasing their overall marketing budget in 2019. 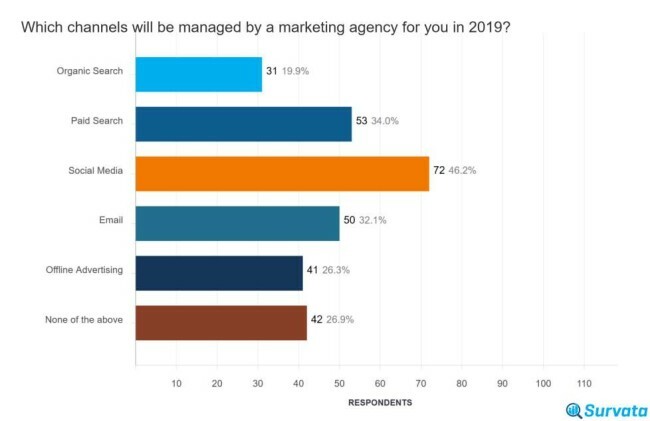 6% more businesses plan on utilizing a marketing agency in 2019 than they did the previous year, with 73% planning on using an agency of some kind. Social media agencies were the primary management channel, with 46% of respondents saying they’ll use one to assist in their social media campaigns. PPC and SEO agencies also saw a projected boost for 2019, while offline advertising and email marketing agencies stayed flat. Though offline advertising is seen as the second hardest channel to manage, companies do not plan on increasing agency participation. Although companies may widely differ in terms of social media management difficulty, they are unified in seeing a high ROI and increasing their investment dollars. This means that even if a company thinks managing social media is difficult, they’re still sending their marketing money in that direction. The findings of this study highlight a striking disparity between businesses to which social media comes naturally, and those to which it does not, with little middle ground between the two parties. The difficulties of managing social media arise from the constant demands of platforms such as Facebook, Instagram, and Twitter. Not all businesses have the time or resources to actively engage with customers on a daily basis. While many companies turn to social media agencies to ease the difficulty of managing this demanding channel, even those who find social media accessible utilize agencies to increase their social marketing efficiency. Maximizing the potential of social media can be a full-time job in itself, which is why many eCommerce businesses, regardless of size, choose to partner with a social media marketing agency. As an eCommerce company owner, the challenge then becomes finding the agency that meets the unique requirements of your business. Fortunately, there’s a platform for efficiently finding the right agency for your brand. DesignRush analyzes and ranks hundreds of professional agencies to help brands discover top marketing partners and tech firms, so you can find the best social media agency today to build your brand into the marketing world of tomorrow.